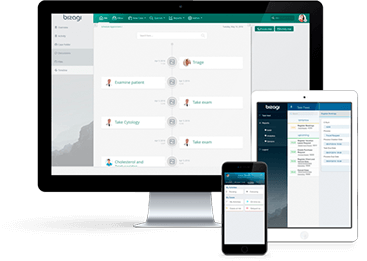 Bizagi Cloud is the most intuitive and flexible way to accelerate your digital initiatives across the enterprise. With low start-up costs, no required infrastructure and by only paying for what you use Bizagi Cloud PaaS provides the fastest, most cost-effective route to value possible. Designed for the most demanding enterprise needs, capable of handling mission-critical, high performance process automation projects spanning thousands of users and millions of cases. Use AI to delight customers, increase process speed and lower risk. Customise the processes look and feel with Bizagi Sites. Enable business users to create low complexity processes directly within the production environment. Accelerate your digital initiatives across your enterprise with Bizagi Cloud PaaS. Contact us for a no-hassle estimate. We offer extremely flexible usage-based pricing. Why? So that you’re in control. You only pay for what you use, and your cost is always connected to the value it offers your business irrespective of the number of users. Not ready for the cloud? Take a look at Bizagi Automation to see if this is the right platform for you.